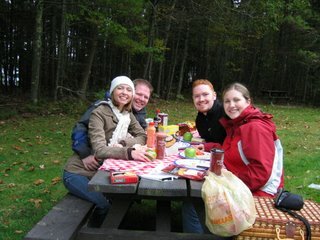 On Wednesday, Joshua and I headed up to Freeport, Maine with Jon and his fiancee Joy. There are many tales that I could tell from the day. Jon and Joshua planned the whole thing and it was pretty much awesome. They even planned a bountiful feast (aka picnic lunch) for us at a gorgeous park on the coast. But this story is the one I want to share (right now) because it was seriously amazing. Well, as we're on the phone with AAA, a state trooper rolls up behind us--lights flashing and all. He was extremely nice and after making sure that we were all okay, he called his dispatch to have a service truck come and help us with the tire. After he left, we were just standing around, eating Chips Ahoy chocolate chip cookies, and wondering how long it would take for a truck to get to us. As we were waiting for either AAA or the other service truck to come, we suddenly see the tail lights of a car backing up on the shoulder in front of us. This guy gets out of his car and comes over to where our car is. Jon, being the protective guy, goes over to tell the guy that we've got everything under control--two trucks are coming for us. He kind of shrugged and said "I'm a mechanic...want me to see if I can help?" And so he does...he walked over to the car, Joshua and Jon explain what's going on with the tire, and he takes a look at it. And then he did the coolest thing...he climbed under the car and, with his steel toed boots, full on kicked the tire off the axle! It was like Chuck Norris had come to our rescue. He stands back up, moves the blown tire to the side, puts the spare on...and then leaves. He was barely there long enough for us to thank him. Not only was this guy extremely cool for roundhouse kicking the tire off the Audi, he also saved us from a long wait in the rain after dark. Amazing. Well, we got home safely, and as I type this post Jon and Joy are getting the tires replaced. Praise God for fun road trips and for the Good Samaritans who still stop to help the person in need!! !